I really appreciate what Gary Brown had to say about his friend. I would like to remind you of his comment. What a great expression of Proverbs 3:13-18. She is a tree of life to those who take hold of her, And happy are all who retain her." His words give testimony to the truth of these verses. Wisdom is where it is at; happiness, our desires satisfied, length of days, riches and honor, pleasantness and peace. 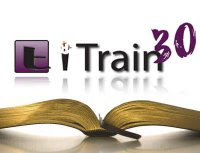 This pursuit of God with a willingness to learn and change and to be transformed by Him is what we are doing through this iTrain30 exercise. I want to thank those of you who are with me on this journey. I am encouraged by your comments and inspired by your insight. As I think about my children and the people I love it dawned on me that pretty much that this passage is what I hope for them. In brief, I pray that they will go after Wisdom. God describes the contrast in these passages between the believer(new man), and the non-believer (Godless). What great things/promises He has in store for those who put their trust in Him! It is only by His grace and mercy that we can claim them. I look at my wife and kids, and understand i have everything i could have ever dreamed of. Thank you God. Great devotion. Only through his wisdom and grace can we succeed in teaching our children to put God first in their lives and make Him their first love. Is it any wonder why these are so important for us.